In a society hyper focused on Google and the multitude of options it provides, finding a valuable IT partner is no easy feat. Take it from us, choosing a winner among companies full of promises is a matter of doing your research and knowing the facts. Here at ITC, we pride ourselves on being different. As an extension of your company as your IT department, we will add immense value to your business by saving you time and energy. That way, you’re free to focus on what matters most – running your business. We recently talked about Why Your Company Needs A Culture Of Trust. Not only is it important to maintain trust within the four walls of your business, but to also cultivate that trust among your IT partner. There is no excuse for an unresponsive IT partner. Think about it – what’s the point in paying for these services when it takes more time to hunt down your support team than to actually fix the problem? Are they really helping you? When an issue arises, you need a dependable team to answer your every call and help solve the issue. As an accountable IT partner, we deliver a dedicated support team to help you navigate through every technological issue. Find an IT company who is up front about pricing. I like money, you like money, everyone likes money – so be smart about where you spend it. There should be no beating around the bush when it comes to the service you are receiving and at what price. Hidden fees and variable expenses can be a real-life nightmare for small businesses. When looking for an IT partner to join your team, make sure to ask the specifics of pricing. If the products and services are not given to you at a set price, that should be a clear sign to hit the ground running. Don’t fall for a trap that will have you spending an arm and a leg on prices you weren’t expecting. At ITC, we are all about flexibility. We offer various integrated plans that will work for your business, not against it. This will allow you to see all prices up front and avoid monthly panic upon receiving your bill. What’s worse than slow response times? Slow response times with an inefficient support team. We saved the best for last because an efficient IT partner might be the most important. When things don’t work how they should, a rollercoaster of emotions is soon to follow. You need an IT partner to efficiently solve the problem right then and there, not tomorrow or next week. Downtime in a business is something we take seriously and is something your business cannot afford. Think about the things you could have accomplished while waiting for your IT partner to fix the issue. Here at ITC, we make the best use of our time to solve your IT issues. That way, you can concentrate your time and energy on everything else. 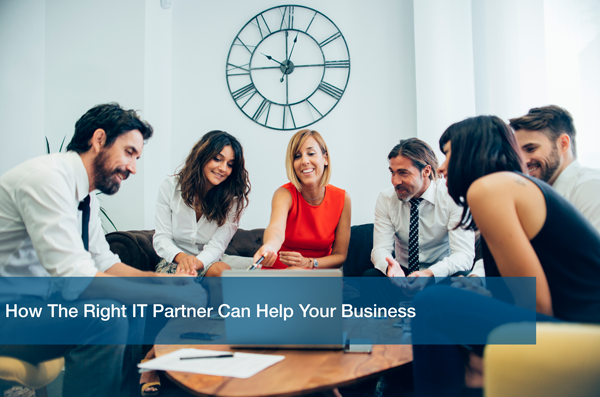 Finding the right IT partner for your business doesn’t have to be draining. With an open mind and a few key qualities to look for, you’ll find an IT partner in no time. At ITC, we provide the highest quality IT service to our clients while staying consistent with pricing and efficiency. For more information, you can check out our previous blog posts or visit our website to Schedule a Free IT Analysis today. Let us show you why companies bet on us to be their reliable IT partner.